The Medical University of Innsbruck, which has been a separate entity since 2004, and the Leopold-Franzens University work in a concerted effort to deal with the National Socialist past. In 1984, the Faculty of Medicine proposed unveiling a plaque on the square in front of the University. 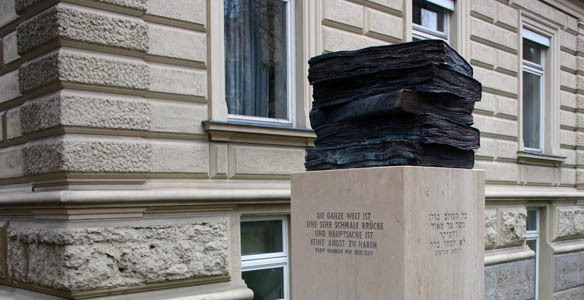 It commemorates medical student Christoph Probst, member of the White Rose student resistance movement. An exhibition was held on the topic in 1988. It was entitled ‘50 Years: The University of Innsbruck in the National Socialist era’. The square in front of the University was renamed Christoph-Probst-Platz in 1994. In 2008, both Innsbruck Universities commemorated displaced members with a portrait series on the internet entitled ‘1938-2008: Displaced scientists’. The memorial erected on the campus of the university clinics bears further testimony to efforts to come to terms with the National Socialist past. The Medical University of Innsbruck and Tilak erected a memorial on the campus of the university clinics in commemoration of the professors, doctors and students of the Innsbruck Faculty of Medicine who were marginalised and displaced in March 1938. The memorial was created by Dvora Barzilai, an artist who was born in Tel Aviv and who lives in Vienna. It was jointly consecrated by University Priest Bernhard Hippler and Chief Rabbi Paul Chaim Eisenberg. The ceremony was opened by President of the Provincial Parliament Herwig van Staa. Chairwoman of the University Council Gabriele Fischer, Board Chairman of Tilak Andreas Steiner, Vice-Rector Manfred P. Dierich and the President of the Jewish Community of Tyrol and Vorarlberg Esther Fritsch spoke on behalf of the organisers. The former editor-in-chief of Jerusalem Post, Ari Rath, presented the biographies of students and professors in his speech.